I don't usually post in the morning, or even during the day - 5 mornings out of 7, I'm at work, and there's barely time to read blogs, much less to post. On Sunday mornings, I'm usually in church. But today, even though it's Palm Sunday, a day where, in my church at least, you get to bring home a souvenir (a palm), I stayed home. My allergies have been really bad for the last few days and the thought of dealing with the Palm Sunday crowd was about more than I could bear. 1. Thanks to a comment to Ann and Kay's latest hilarious post, I cannot get "King of the Road" by Roger Miller out of my mind. Of course, after reading that Wikipedia entry for Roger Miller, I seem to be moving on to "England Swings." I don't seem to really know more than the chorus of "England Swings," though, and that's really frustrating. 2. You've seen pictures of my current kitties, Simon and Harley. Here are my previous kitties, Charlotte and Aggie. Like Simon, Charlotte was a tuxedo cat. The only white on her face was on her chin and her whiskers. She was kind of a little cat and was the best cat ever. I got her in January 1985, when she was about 7 months old. She had been a stray, and I got her from a vet's office. She lived to be 18, when she went into kidney failure very suddenly. She definitely ruled the roost. 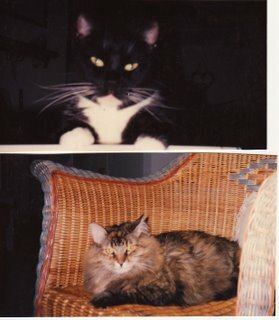 For the last few years of her life, she lived not just with Aggie but with Simon and Schuster (my sister's other cat). Oh, and with my sister and me, too! She was a very sweet cat, very easy to live with, but definitely in charge of the cat posse. Are you tired of the Cable Footies yet? It's a Pink Cable Footie!